Halifax Hammers dented Waiters Arms’ hope for the Premier Division title with a 7-2 win on Sunday. Hammers twice pressed the Waiters’ keeper Ethan Daly into action through Lamin Jannah and Terriq Pervez before Mazn Amhamed was also denied with a long-range free-kick. 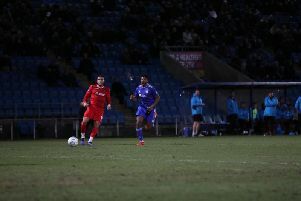 At the other end David Chappell saw his effort well saved by Hammers keeper Yasar Mohammad, and Hammers took the lead after 25 minutes through Jannah. After half-time, Waiters equalised when Billy Grogan chipped the ball over the Hammers keeper. But that was as good as it got for Waiters as youngster Awais Khan restored the visitors’ lead, which was soon extended to 3-1 through Pervez. It was 4-1 two minutes later, again through Pervez, who then completed his hat-trick to make it 5-1, Hammers’ fourth goal in 12 second-half minutes. Billy Grogan pulled one back for the hosts before some gloss was added to the scoreline by Hammers thanks to Khurram Shazad and a penalty from keeper Mohammed. That result leaves Waiters top but only on goal difference from Carrington, who have two games in hand, with the top two set to play each other in the league on Sunday. Elsewhere in the Premier Division, Hollins Holme and Barge drew 0-0. In the Invitational Cup, Mount Tabor and North Bridge drew 1-1, Halifax Hammers Reserves thrashed Bradshaw 6-2, and Ryburn United smashed Old Pond 8-1.